On, of, and about languages. The majority of languages spoken in North Eurasia belong to three language families—Turkic, Indo-European, and Uralic. My native language Finnish is a part of the Uralic languages; the main branches of the family are the Finno-Ugric and the Samoyed. While there’s rough agreement over where and how Uralic languages developed and spread, and over what types of material cultures were found in the corresponding areas, no-one’s done comprehensive studies on the genetic history of Uralic-speaking peoples before. This interdisciplinary study, lead by Kristiina Tambets from the University of Tartu, Estonia, compared genome-wide genetic variation of nearly all extant Uralic-speaking populations from Europe and Siberia. I find the question of which material cultures may have spread together with which languages absolutely fascinating. Having my own small language / culture be a part of a larger study like this makes it even more special. While I doubt these three will go extinct very soon, there’s pressure at least in Finland to adopt more and more loanwords from English. Then again, we three may end up being rather rare, all in all, and I’m not quite sure whether to be alarmed over our potential disappearance or proud of our preciousness—or both. Tambets, Kristiina et al. 2018. “Genes reveal traces of common recent demographic history for most of the Uralic-speaking populations”. Genome Biology 19:139. DOI: https://doi.org/10.1186/s13059-018-1522-1. The article is openly accessible (CC BY 4.0). Image screencapped from Kristiina Tambets et al. Let me tell you about the word tamias. Tamias is a word in Ancient Greek. It was the title of the official in charge of the Athenian state treasury. It is related to the verb temnō, which means to cut something up into pieces, especially used of carving meat. Now, meat was not always easy to come by in ancient Greece. Most people would not have eaten meat on a regular basis, at least not from land animals—bird and fish meat was probably a little easier to come by, but meat from animals like cattle, sheep, goats, and pigs was a rarity. In fact, meat from these animals was almost always consumed as part of a sacrifice. When the ancient Greeks offered an animal to the gods in sacrifice, only a small representative portion of the animal was usually burned for the gods. The rest of the meat was cooked and consumed by the community. Since sacrifice was a religious act, there were important rules about the procedure. One was that the portions of meat shared out among the participants had to be of equal size. To do otherwise would be to suggest that the blessings of the gods invoked by the ritual should come down unequally. The carver who prepared the meat for cooking therefore had a job that required both expertise and a solemn devotion to the good of the whole community. When the Athenians were organizing their state and assigning one official to responsible for managing the state finances, it makes sense that they would invoke the image of the old sacrificial carver for an official who would take on a post of such weighty responsibility, but this is not where the saga of tamias ends. A treasurer’s job is not just to share out funds equitably but also to store and guard valuable goods so they will be available in the future when needed. This is the idea invoked by the scientific name Tamias striatus (literally ‘stripey treasurer’) for this fellow. 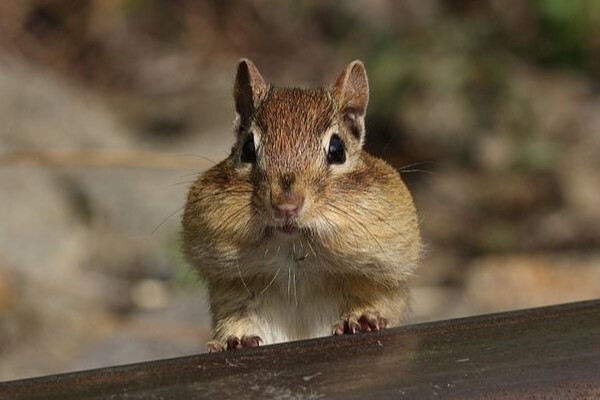 The chipmunk carries food in its big cheek pouches and stores it for the winter in its burrow. From food to gold and back to food again: that’s the history of tamias. It’s been said that one of the measures of skill in a language is the ability to tell a dirty joke. It looks like some women in central Gaul were up to snuff in their Latin. The evidence comes from a set of loom weights with Gaulish and Gaulish/Latin inscriptions. Loom weights are small weights, often made from stone, pottery, or metal, used to keep tension on the fibers in certain types of loom. They are a very common find in archaeological sites because they were simple everyday objects that lots of people used, people needed a lot of them, and they were easy to replace if they got damaged or broken. (So many loom weights turn up in archaeological digs that there’s a joke among archaeologists that if you find something you can’t identify it’s probably a loom weight.) Most loom weights are quite simple objects, like the Saxon examples in the illustration here, but a collection of loom weights with inscribed texts have been found in France, dating from some time during the Roman period. Early researchers concluded that this naughty loom weight must have been made by a man and given to a woman who didn’t understand the double meaning, because women are delicate flowers who would never say such a thing. More recent scholarship has pointed out that those earlier researchers clearly haven’t spent enough time around women. 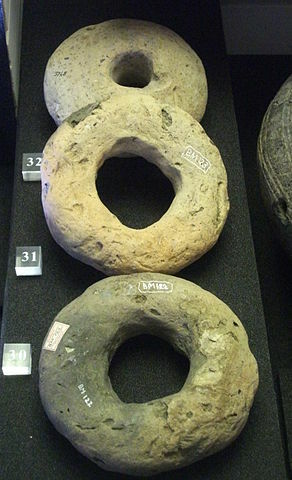 These and other (even naughtier) loom weights suggest that there was a community of Gaulish-speaking women who were also sufficiently familiar with Latin to make dirty jokes. Textile work was traditionally a women’s activity and would have taken up a significant part of their time. It could also be a social activity. We should imagine these Gaulish women gathered together weaving, sewing, and chatting, not unlike a modern craft circle. In that context, these loom weights with their rhythmic sayings and naughty suggestions would have been a playful accent to enliven the working day. Two days until the opening day for Arrival—I am so excite! Some things are just too silly not to share! The movie summer and early fall have been rather dry, as has the actual weather here. I’m eagerly awaiting November when Doctor Strange (six weeks to go!) and Arrival (seven weeks!) open a hopefully more thirst-quenching end of the year. And the more I hear about Arrival, the more intriguing it sounds. Mark Liberman at Language Log was asked to provide a linguist’s perspective on first-encounter communication strategies. His post is both lengthy and enlightening. “There’s no guarantee that their senses and their modes of action are going to be a good fit to ours. They might communicate via skin color changes like cuttlefish, except maybe theirs are only visible in the ultraviolet. Or maybe they can modulate and sense electric fields, like electric eels. They might use gestural and postural changes in a body that’s very different from ours, or rapid morse-code-like modulations of sound at a dozen different frequencies independently and simultaneously. Maybe pheremone-like chemical signals are a crucial part of the process. “Whatever the modalities of communication, it’s quite likely that we won’t be able to imitate them without building some specialized apparatus. And it’s quite possible that it would be hard even to recognize the fact that they’re communicating with one another, before we even get to the point of trying to understand and imitate. Visit Language Log for more. On the basis of the Arrival trailers released so far it’s hard to say whether the movie will be focusing on linguistics specifically, or whether the intellectual mystery will be rounded up into a more generic academic exercise. It does look like the script at least attempts to stay with Chiang’s story. Like Liberman, I’m very interested to see how much of the linguistics makes it on screen. Have you heard of Arrival? 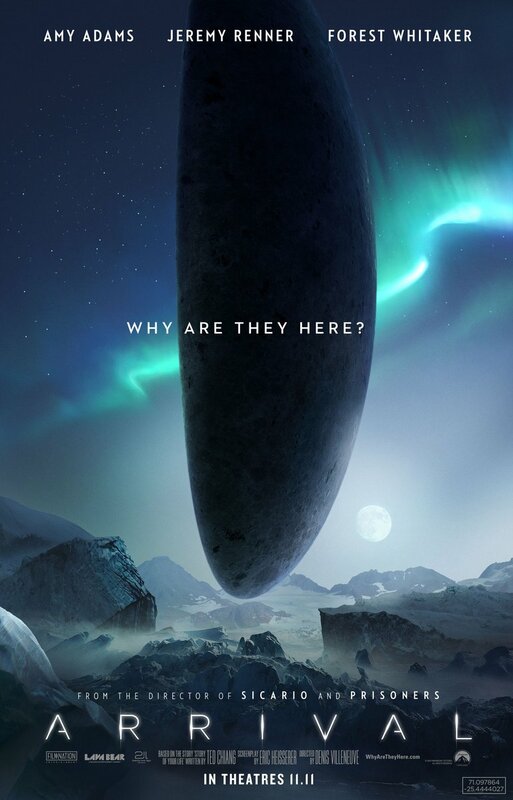 It’s a forthcoming science fiction movie about a first contact situation on earth, and the more I read about it the more curious I get. The story is based on Ted Chiang’s 1998 novella “Story of Your Life,” adapted to screen by Eric Heisserer and directed by Denis Villeneuve. Chiang won both the Nebula and Sturgeon Awards with it. The main interest for me is that Dr. Louise Banks, the character played by Amy Adams, is a linguist. Since we don’t generally get much screen time, it’s exciting, as is having languages / linguistics as a story focus. There’s also a little bit of Nordic involvement: the score is by Icelandic composer Jóhann Jóhannsson. I love the fact that for a change the UFO that lands in the U.S. touches down in Montana, not New Frigging York City. That horse is thoroughly, properly dead, ladies and gentlemen of Hollywood. Thank you for not going there. Judging by the trailer, the movie also avoids one of my pet peeves. It looks like finding a way to communicate with the aliens is going to take a lot of effort and a good, long while. We get glimpses of various graphics on computer screens, but it’s clear that the bulk of the work consists of human effort assisted by computers. In other words, people are doing the actual analyzing while computers number-crunch. Compare it, for instance, with the mothership scene in Close Encounters of the Third Kind (a clip of the scene here). As fascinating as the tonal-color language is, I’m so disappointed with the perfunctory and hand-wavy treatment the linguistic mystery got. I do hope that the Arrival trailer is accurate in acknowledging the effort that not only communication but of all kinds of intellectual work require. I don’t know what to make of the decision, and I can’t wait to see which one the movie actually goes with. Fortunately I don’t have that long to wait: the U.S. release date is November 11, 2016.